1.2 What's this about blogging? As part of the 'constructivist' approach to teaching and learning, you will be applying Higher Order Thinking Skills (HOTS) in the creation, evaluation and analysis of professional, teaching blogs. In the creation of a professional blog, you will learn essential technical skills required to open, manage and design a digital space. You will analyze and evaluate educational blogging tools, processes and products. You will create a digital presence in your professional blog that will model digital citizenship, apply digital design techniques and showcase digital standards. Let's begin to explore the purpose and products of educational blogs. Finding more information about educational blogs is as easy as doing a web search e.g. this ultimate guide to using blogs. ​Finding examples of great educational blogs can also be done with a web search e.g. Edublog Award winners 2014. Read some informative blogs such as Do Educators Really Need Blog Posts? or Start Your Teaching Blog: Resources, Advice, and Examples. 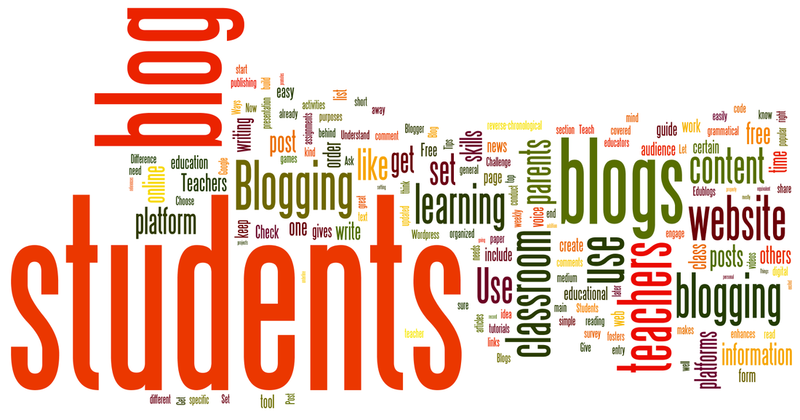 Examples within the field of teacher preparation, where students and teacher candidates in their pre-professional and professional study are also learning about blogging. University of Regina, Dean Shareski provides some considerations for blog posts for his students (in the undergrad course ECMP 355) to establish guidelines to their blogging experience. University of Saskatchewan - Alec Couros, Social Media and Open Education (EC&I 831) collects student blogs in this Blog Hub. Brock University - Ed Tech Cohort course taught by Dr. Camille Rutherford with links to student blogs, twitter feed for student networking, and current trends in Educational technology. Students from some courses at Lakehead University create and manage a blog as part of their course work. Here are some samples from previous participants in EDUC 3239 and EDUC 4000. Classroom applications of blogging include opportunities to embed the Four C's (Critical thinking, Collaboration, Communication, and Creativity) and digital citizenship skills. More about the 4 C's can be found HERE. These videos show how one classroom teacher is applying blogging to the reading, writing, media and communication skills for her students. Read this blog post by Richard Byrne and then access the comparison chart for each of the recommended blogging tools. You can also investigate Web Page tools that include blogging as an option - Weebly is one such tool. For the purpose of this course, I'm suggesting you use BLOGGER since this is provided to you as part of your university Google account. BLOGGER is a free tool that will allow you to get into blogging for yourself as a professional user and for your future use as an educator if Google Classroom Tools are used by the school system. ​Please check with your instructor if you are interested in any other blogging tools. Learn about the features and affordances of blogs. Watch this video on How to Set Up a Blog on Blogger to get started. Here are some links to get you started with pages, posts and templates. Once your blog is created, prepare your first blog message. This should be a brief introduction to you as a digital producer and participating citizen of the digital world. No more than two paragraphs will be a great beginning. Think about purpose, audience and text features as you compose your initial content (there is always time to edit any and all messages). CREATE your first PAGE - this could be an 'about me' page to outline some basic information about yourself. CREATE your first POST - introduce yourself to the blogging audience with a story about your shoe including your 'shoe selfie' image.